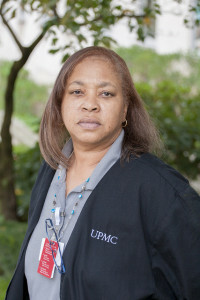 My name is Leslie Poston, and I am a UPMC employee. I’m coming together with my coworkers to call on UPMC to create good jobs for a strong and healthy Pittsburgh – will you join us on Monday March 3rd, as we call on UPMC to create good jobs? I have worked at UPMC Presbyterian for ten years. I work hard every day to make sure that the heart and lung transplant unit runs smoothly, and that my patients receive the best quality care. Recently I saw an ad that UPMC took out in the Pittsburgh Post-Gazette saying UPMC gives to the Greater Pittsburgh Food Bank so that people in Pittsburgh can eat. This is a great thing. Generosity towards people in need is really beautiful. But the ad also struck a nerve, because I AM one of the people who uses a food bank. So are many of my coworkers. I try to work as much overtime as I can so I have more to make ends meet. That’s because if I work only full time, my take home pay is about $350 dollars a week. After rent, utilities, transportation, there’s just nothing left. I’m also struggling to pay thousands of dollars in medical debt that I owe to UPMC. This past fall I was hospitalized for a couple of days and my UPMC insurance didn’t cover all the costs. As I keep telling the people who call me every day, I just don’t know how I’m going to pay it off. Even if I saved every possible penny and worked hundreds and hundreds of hours of overtime, I can’t get ahead. I’ll just be paying off my hospital stay. I believe that a person who works full time and does a good job at a 10 billion dollar global health care system ought to have a path out of poverty and should not be impoverished by their medical costs. 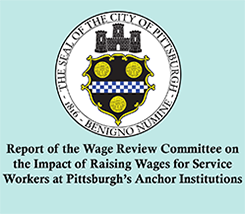 I believe that this should be a bigger priority for UPMC than corporate jets and fancy signs on top of the highest tower. 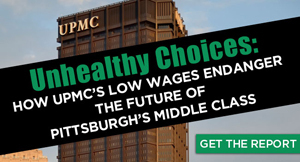 UPMC can and must do better for all of us. Please join me and my co-workers and join us on Monday as we call on UPMC to create good jobs for a strong and healthy Pittsburgh.